2014-2017 C7 Corvette Automatic Engine Fluid Cap Set - "Corvette" Script. Give your C7 Corvette Stingray engine bay a visual boost when you add our 5 piece Corvette Lettering Script Emblem Fluid Cap Cover set. These high quality caps are made in the USA and are designed to fit directly over your factory engine fluid caps. SET INCLUDES (5) Chrome Caps with Stainless Steel Corvette Lettering and faux Carbon Fiber inlay. 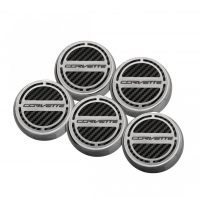 Log In To See Pricing 2014-2017 C7 Corvette Carbon Fiber Engine Fluid Cap Set - "Corvette" Script. 7 colors available. For man. trans. only.